The first Five Kage Summit since the Otsutsuki clan’s invasion is being held in the Village of the Hidden Leaf, and the past Kages are also gathering. However the third Tsuchikage Ohnoki who was meant to come has not appeared, and the meeting has begun without him. 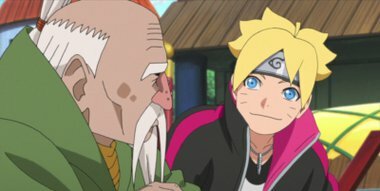 Around this time Boruto and rest of Team 7 are attending a meeting with other ninjas in regards to security during the summit. But Boruto is bored by this unexciting mission, and is completely disinterested. Mitsuki then poses a certain question to his teammates of Team 7.